Consolidation • Vail CEO says the ambitious project, planned for the summer, will create the largest resort in the country. Francisco Kjolseth | Tribune file photo Skiers and snowboarders ride the Payday lift at Park City Mountain Resort. Vail Resorts plans to build lifts next summer to connect Canyons Resort to newly acquired Park City Mountain Resort (PCMR). "[We] will be looking to upgrade or add new lifts, restaurants and snowmaking capabilities at both resorts," Vail Chief Executive Rob Katz said Wednesday in the Denver-based company&apos;s financial report for the fiscal year that ended July 31. More details about the consolidation will be disclosed next March, he added, noting "we look forward to working with the Park City community as well as local and county officials to finalize this plan." Park City Mayor Jack Thomas said he could not comment on Vail&apos;s plans "until I see something more specific," but in general, he believes a combined resort "will be a good draw. "It could be something that will help Vail&apos;s international and national marketing and raises a lot of curiosity about our market and what we all know to be the greatest snow on Earth," he added. "I think you&apos;ll see a lot of capital put into their facilities." That prospect excited Ski Utah President Nathan Rafferty. "We knew that would be one of the big upsides with Vail. This builds a lot of anticipation about what they&apos;re planning to do," he said, pointing to the possibility of replacing several fixed-grip lifts with high-speed chairs. Interconnect • Rafferty also said the decision to proceed next year boosts the OneWasatch plan his ski-marketing organization is pushing to interconnect the seven central Wasatch Mountain ski resorts. Vail&apos;s plan "turbocharges that concept," he said. "It will be really exciting when they reveal lift alignments and the runs that go with it." Save Our Canyons Executive Director Carl Fisher also is interested in those alignments, observing "there are backcountry areas high in Summit County that are publicly owned. We would hope that access and those experiences are protected." While adamantly opposed to the overall interconnect proposal, he hopes a combined resort "satiates their marketing needs. That&apos;s what it&apos;s all about  marketing." If not, he thinks Vail should supplement its Canyons/PCMR connection with a link to Deer Valley, anticipating the challenges of tying the three Summit County resorts together will emphasize how difficult it will be to hook up with the Cottonwood Canyons&apos; ski resorts as well. "This is their opportunity to show skeptics how this concept is going to function," Fisher said. "Show how easy or hard it is to get from Deer Valley to Canyons and back. Show how that plays out." Financial details • Vail&apos;s financial report was the first issued since the company bought PCMR&apos;s base facilities and lower mountain from Powdr Corp. on Sept. 11 for $182.5 million, ending three years of tumultuous litigation that had the potential to close PCMR this winter. Talisker Land Holdings, which owns Canyons Resort and has hired Vail to run it for the next 300 years, also owns most of the mountainside it rented to PCMR for decades until PCMR mistakenly failed to renew its lease in 2011. In the report, Vail said it spent $9.8 million this past fiscal year on litigation expenses and integrating Canyons into its operations. Despite those expenses, Vail reported its earnings before interest, taxes, depreciation and amortization (EBITDA) in fiscal year 2014 were $268.8 million, up 11.6 percent over the previous year. Adding PCMR to its portfolio is projected to contribute another $35 million next year to its EBITDA (projected at $340 million to $360 million), excluding $5 million in ongoing "litigation, transaction and integration expenses." Largest resort in U.S. • "We expect to generate significant additional EBITDA growth as we implement our plans to combine the ski experience of Park City Mountain Resort and Canyons into the largest mountain resort in the United States with over 7,000 acres of skiable terrain," said Katz. "We believe the combined resort, with an unparalleled location in Park City, will attract destination skiers from across the United States and around the world and will drive season-pass sales, visitation and ancillary business," he added. "This is truly a transformative acquisition for Vail Resorts." 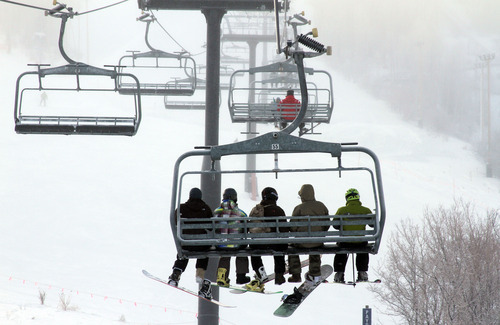 Last winter, Vail&apos;s 10 U.S. resorts (Canyons plus four in Colorado, three in California, and one each in Minnesota and Michigan) attracted 10.2 percent more skier visits than the previous season. Lift-ticket revenues were up even more  14.4 percent  driven largely by a 20.1 percent increase in money from season-pass sales, which Katz said accounted for 40 percent of those lift-ticket revenues. With PCMR now in the fold and included in Vail&apos;s Epic Pass program, which gives buyers access to all of the company resorts, season-pass sales for the 2014-15 winter were up 14 percent as of Monday. For the past year, Vail&apos;s net income was $28.5 million, or 77 cents per share, compared to $37.7 million, or $1.03 per share, the previous year. That was based on net revenues of $1.25 billion, up 12 percent from $1.12 billion in 2013-14. Mammoth Mountain ski area in southern California has signed a $38 million deal to acquire the company that runs Bear Mountain and Snow Summit resorts in the San Bernardino Mountains. The deal for Snow Summit Ski Corp. includes a golf course, driving range and several parking lots  as well as rights to 438 acres of skiable land owned by the U.S. Forest Service. It puts Mammoth Mountain in control of more than 4,000 skiable acres in California, visited by about 2 million skiers and snowboarders a year. Acquiring the ski areas might not be the main focus of the deal, according to the Los Angeles Times. Mammoth Mountain&apos;s biggest investors are resort developers who already have plans to build on the land around Bear Mountain and Snow Summit.